Have you ever asked yourself what makes your desk chair to sink? Some of the common problems include a defective gas strut and the failure of the adjuster to engage properly. You do not have to run up and down looking for an expert to assist you fix a sinking chair because you can do it yourself. In our discussion below, we have provided you with simple tips on how to fix a sinking desk chair. Note: Most seats use the 4mm hexagonal screws but not all of them. Therefore, you have to check with your chair before getting the right hexagonal key for the same. Once you have the required tools for the job, the first step will be to remove the seat and its backrest by unscrewing the screws connecting the seat to its metal support system. Although this operation is not mandatory, it allows for easy working on the different parts of the seats from the strut to its housing. 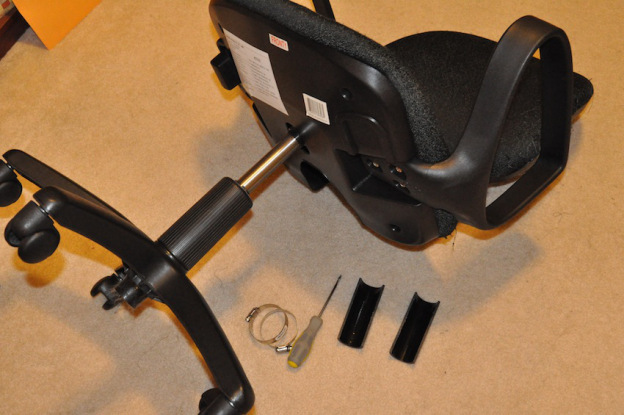 After removing the seat and backrest, hold the chair upside down and tap the metal support very vigorous to remove the black plastic and telescopic dust protections. Then place the chair upright and return the seat gently without pressing so that you measure the distance between its gas cylinder and the end of the seat very accurately (while fixing my office chair I noticed this distance was 130mm). This does not mean that the distance must be 130mm since every chair has its own specifications. Measure this distance (in my case 130mm) beginning from the thick side of the polypropylene pipe as accurately as possible. If you want to lower the office seat, cut a smaller sized piece (I had to use 85mm instead of 130mm). This implies that when someone sits on the chair, it will fall from 130mm to 85mm. Moreover, you can add on the tubes strength by fixing zip tie loops at the circumference of the pipe. The next thing will be to press the cut down the chair’s strut and then fix the same tightly. With the tube tightly fixed in the strut, tie the zip ties to form a loop and then wrap with a bit of force to fix it around the tube of the chair tightly. One of the loops should occur where the PP tube meets the strut cylinder while the other should be at the uppermost part of the tube where it meets with the seat. Thereafter, return the plastic dust protections removed earlier on. The last step will be to insert the strut’s tip in the housing of your seat with the help of the red arrow found in most of the seats but not all and then press hard so that the housing ridge fits in the gap lying between the strut and the PP pipe end. Up to this point, your seat will be ready for use once again. How do you fix a chair with a higher weight limit?